I think it's safe to say the textured nail trend is over. I think it died with 2014. I can't say I ever was into the trend, but there were a few I liked from Zoya and Julie G. They definitely find their way into my rotation every once in awhile and I still appreciate the good ones. I have a Julie G one to show you today. 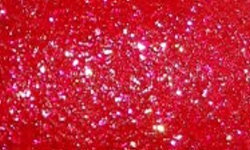 Hot Cinnamon is a cherry red with red textured sparkle. Color: I think I maybe one of the few nail addicts who love red nail polish. I think it's because it's a color that suits me best. That being said, this is a great red. I love the vibrancy of this red and it would be great for the upcoming holiday season. I like the textured look of this, the texture particles are uniform and makes this look chic and streamlined. Formula: Excellent easy to use one coat formula. That's one of the reasons I love textures. Price: You can purchase this on the Jesse's Girl website for $3.99. Overall: This is a great textured red polish. I think there were some textured fails out there -cough- Zoya Ultra Pixies-, but ones like this I don't think are outdated at this point. I like the look of it, and it's a great all around polish.